What role(s) do emotions have in choice preference? Individuals’ choices depend on their memories and cognition but also on their current emotional state. Emotions can play a necessary functional role in decision-making, but in doing this, emotions can alter the stability of the process. The argument for a necessary functional role of emotions is supported by converging evidence from neuropsychological patients with impairments in either emotional responding or in decision-making, alongside human brain imaging. We also point out that functional brain imaging studies need to target brain areas responding to emotion in order to provide stronger evidence for emotion specifically modulating the process of decision-making to influence choice preference. Neuropsychological studies have shown that patients with damage to ventromedial prefrontal cortex (vmPFC) brain regions display flattened emotions, an inability to respond to emotional events, and less responsiveness to punishment (Fellows and Farah, 2005; Naqvi et al., 2006). In addition, patients with vmPFC lesions show impaired decision-making. It has been argued that this impaired decision-making reflects altered emotional reactivity. The “somatic marker hypothesis” proposes that in situations where choices could bring either positive reward or negative outcomes and losses, decision-making is modulated by the ability to recruit emotional feedback from past events (Bechara et al., 1994). The Iowa gambling task (IGT; Anderson et al., 1999) has been used to test this hypothesis and examine the phenomena of poor decision-making in patients with damage to prefrontal cortex. Players must select a card from one of four decks. Each card leads to winning or losing money. Unknown to the player, some decks contain cards with higher gains and losses, which if repeatedly selected will lead to an overall loss. Over the course of multiple trials, typical players begin to avoid these high risk decks. Patients, on the other hand, were found to be unable to forgo immediate gains for long-term reward to win the game. The results also showed that patients with vmPFC damage, unlike healthy controls, did not produce skin-conductance responses (SCRs), a physiological measure of emotional responsiveness, before making choices that had negative outcomes. The vmPFC may therefore be necessary for the emotional evaluation of future choices. Interestingly, patients with amygdala damage were also found to perform poorly on the gambling task (Bechara et al., 1999; Weller et al., 2007). However, unlike vmPFC patients, amygdala patients not only failed to emotionally react in anticipation of a negative choice, but failed to produce SCRs after negative decision outcomes. This suggests that the amygdala is part of a feedback circuit that evaluates the emotional outcome of choices, modulating prefrontal regions. Emotional associations can thus bias choice preference. Note that the emotional state of the participant in these paradigms can change rapidly across trials, and the data suggest that this modulates decision-making. Emotional modulation of decision-making can make human choice contextually dependent, but this is at the cost of stability in decision-making, across different emotional contexts. These results contrast with at least some of the results from functional magnetic resonance imaging (fMRI) studies, for instance Lawrence et al. (2009) carried out an fMRI study of healthy control participants performing the IGT. The blood-oxygenation-level dependent (BOLD) contrast was accessed across specific time periods within each choice trial. The BOLD signal (based on blood flow) is proportional to neural activity. Comparing activity at the point where participants found out the outcome of their decision (i.e., when a reward or punishment from making a choice was shown) revealed more activity in the caudate, nucleus accumbens, insula, and thalamus for choices which yielded a reward (winning money) compared to responses which resulted in punishment (losing money). They also compared activity between trials where participants had to actively choose a card to those where participants had to select specified card decks. Regions of the vmPFC, implicated in the neuropsychological studies were more active for decision-making trials than for control trials. More specifically, higher BOLD activity was reported in bilateral areas of the medial orbitofrontal cortex (BA 11), as well as in regions of the ventral anterior cingulate cortex (BA 24 and 32), extending to the caudate. In addition, when making choices that would lead to overall losses of money in the task, neural activity was found in the orbital frontal cortex and insula. Other fMRI studies using the IGT have found similar activity in the medial frontal gyrus (BA 10; Fukui et al., 2005; Windmann et al., 2006). These results point to a role of orbito- and medial-frontal cortex in relation to positive and negative aspects of reward in the IGT, but they do not necessarily demonstrate the involvement of emotion-based influences on decision-making as opposed to other aspects of the evaluation process. Indeed, other research suggest that key neural regions that form part of the neural circuitry for emotional responding, namely the amygdala and hippocampus, are not involved during the task (Li et al., 2010). To assess whether there is a more specific role of emotion in the IGT, we have recently assessed activity in brain regions specifically associated with positive and negative emotional responses. Participants viewed pre-categorized images from the International Affective Picture System (IAPS; Lang et al., 1997) conveying positive, negative, and neutral valence. Regions found to be more activated by positive than negative emotion, and vice versa, were then used as regions of interest for the analysis of brain activity during the IGT. A comparison was carried out on the percentage of change in BOLD signal between individuals who learned the task (who selected more cards from advantageous card decks) and non-learners (who selected more cards from disadvantageous card decks). Example data from the region specific to positive emotion in the time period in response to choice outcome are presented in Figure 1. Figure 1. 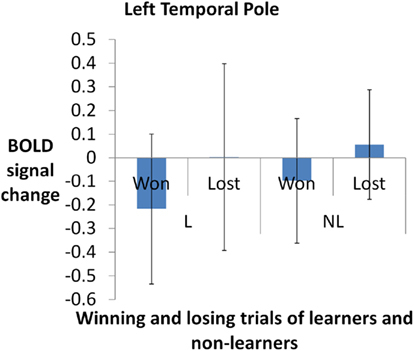 Blood-oxygenation-level dependent signal change for winning- and losing-trials in the left temporal pole (a region specific to positive emotions i e., positive minus neutral contrast of IAPS picture rating task. L, learners (who chose from advantageous card decks more frequently). NL, non-learners. Activity was higher for the winning trials, F(3,57) = 7.562, p < 0.001. Error bars denote SD of the group. The region of interest analysis revealed that activation in the left temporal pole varied as a function of the type of reinforcement (i.e., positive or negative outcome). Other results suggest that the left temporal pole is a crucial part of the neural network involved in emotional reactivity (Lee et al., 2004; Britton et al., 2006). Thus, the results indicate that a critical brain area involved in emotional responding (the left temporal pole), and independently defined in relation to emotional stimuli, was differentially activated in the IGT. While supporting the case for emotion-based modulation of decision-making in the IGT, we note also that there was no evidence for differential activation of the vmPFC, though this was activated in our emotional localizer task (the IAPS). Hence, it remains unclear whether any involvement of the vmPFC in the IGT reflects emotion-based responding or other aspects of decision-making. Irrespective of this, the results indicate that brain areas involved in emotion are significantly active during decision-making, and provide a context for temporary instability when decisions are made. To evaluate whether this context plays a causal role in decision-making, though, requires that further steps are taken, which we consider below. Understanding the role of emotion in decision-making that is influence by current emotional state on a moment to moment basis, strongly effecting stability of choice has important clinical implications. Apathy is a disorder of diminished motivation that affects every day adaptive behavior (Marin et al., 1994). Clinical studies have found that motivational loss as a result of apathy affects quality of life by (amongst other things) reducing social interactions (Resnick et al., 1998; Reid-Arndt et al., 2007). Njomboro (2009) examined the performance of brain-injured patients either with or without symptoms of apathy. Apathetic patients showed reduced effects of reward in the IGT, and were neither strongly affected by high reward values in the initial stages of the task nor by longer-term reward outcomes as the task progressed. The results suggest that lowered emotional responding, found in apathetic patients, can have a direct effect on the reward-mediated decision-making. Emotion mediates the effects of a reward, influencing individual’s choices, however this pathway may not be present in these patients. Clinical studies have investigated the roles that neural structures and circuits play in bringing about and maintaining a motivational state, which if affected, results in less goal-directed behavior (Brown and Pluck, 2000; Marin and Wilkosz, 2005). The anterior cingulum, nucleus accumbens, ventral pallidum, thalamus, and the ventral tegmental area form the core of the neural system recruited for motivation, and the nucleus accumbens, ventral pallidum, and thalamus have been suggested to modulate motivation (Marin and Wilkosz, 2005). Marin (1996) posits that apathy emerges when there is damage to this circuitry. Similar neural networks including neural areas such as the anterior cingulate and nucleus accumbens are also related to performance on the IGT. The basal ganglia has also been reported to be involved in conveying motivational signals to and from the frontal cortex (van Reekum et al., 2005) for decision-making. Damage of the basal ganglia may be critical for apathy and may lead to impaired performance in the IGT. A clear future direction for research is to assess the role of different brain regions affected in a wide variety of disorders where apathetic symptoms may occur (e.g., in Parkinson’s disease in relation to the basal ganglia), to test for a modulating role on decision-making which has implications on the stability of choice preference. Functional magnetic resonance imaging has revealed the involvement of vmPFC and subcortical regions in decision-making. This is informative about the neural areas affected in motivational disorders that have been postulated to involve similar neural networks. Further studies that combine neuropsychological analyses with functional brain imaging should provide evidence not only that damage to brain regions dealing with emotional responding can alter neural activity in decision-making, but also that emotional change acts as a mediator of choice preference. Any mediating effect of emotion will change the stability of decision-making, making choice preference both more labile and more flexible than would be the case if decisions were purely cognitive in nature. Anderson, S. W., Bechara, A., Damasio, H., Tranel, D., and Damasio, A. R. (1999). Impairment of social and moral behaviour related to early damage in the human prefrontal cortex. Nat. Neurosci. 2, 1032–1037. Bechara, A., Damasio, H., Damasio, A. R., and Lee, G. P. (1999). Different contributions of the human amygdala and ventromedial prefrontal cortex to decision-making. J. Neurosci. 19, 5473–5481. Britton, J. C., Taylor, S. F., Sudheimer, K. D., and Liberzon, I. (2006). Facial expressions and complex IAPS pictures: common and differential networks. Neuroimage 31, 906–916. Brown, R. G., and Pluck, G. (2000). Negative symptoms: the ‘pathology’ of motivation and goal-directed behaviour. Trends Neurosci. 23, 412–417. Fellows, L. K., and Farah, M. J. (2005). Dissociable elements of human foresight: a role for the ventromedial frontal lobes in framing the future, but not in discounting future rewards. Neuropsychologia 43, 1214–1221. Fukui, H., Murai, T., Fukuyama, H., Hayashi, T., and Hanakawa, T. (2005). Functional activity related to risk anticipation during performance of the Iowa gambling task. Neuroimage 24, 253–259. Lang, P. J., Bradley, M. M., and Cuthbert, B. N. (1997). International Affective Picture System (IAPS): Technical Manual and Affective Ratings. Gainesville: NIMH Center for the Study of Emotion and Attention. Lawrence, N. S., Jollant, F., O’Daly, O., Zelaya, F., and Phillips, M. L. (2009). Distinct roles of prefrontal cortical subregions in the Iowa gambling task. Cereb. Cortex 19, 1134–1143. Lee, G. P., Meador, K. J., Loring, D. W., Allison, J. D., Brown, W. S., Paul, L. K., Pillai, J. J., and Lavin, T. B. (2004). Neural substrates of emotion as revealed by functional magnetic resonance imaging. Cogn. Behav. Neurol. 17, 9–17. Marin, R. S. (1996). “Apathy and related disorders of diminished motivation,” in Review of Psychiatry, Section II: Neuropsychiatry for Clinicians, eds L. J. Dickstein, M. B. Riba and J. M. Oldham (Washington DC: American Psychiatric Press), 205–242. Marin, R. S., Firinciogullari, M. S., and Biedrzycki, R. C. (1994). Group differences in the relationship between apathy and depression. J. Nerv. Ment. Dis. 182, 235–239. Marin, R. S., and Wilkosz, P. A. (2005). Disorders of diminished motivation. J. Head Trauma Rehabil. 20, 377–388. Naqvi, N., Shiv, B., and Bechara, A. (2006). The role of emotion in decision making; a cognitive neuroscience perspective. Curr. Dir. Psychol. Sci. 15, 260–264. Njomboro, P. (2009). The Neuropsychiatry of Apathy. Ph. D. Thesis, University of Birmingham, UK. Reid-Arndt, S. A., Nehl, C., and Hinkebein, J. (2007). The frontal systems behaviour scale (FrSBe) as a predictor of community integration following a traumatic brain injury. Br. Inj. 21, 1361–1369. Resnick, B., Zimmerman, S. I., Magaziner, J., and Adelman, A. (1998). Use of the apathy evaluation scale as a measure of motivation in elderly people. Rehabil. Nurs. 23, 141–147. van Reekum, R., Stuss, D. T., and Ostrander, L. (2005). Apathy: why care? J. Neuropsychiatry Clin. Neurosci. 17, 7–19. Weller, J. A., Levin, I. P., Shiv, B., and Bechara, A. (2007). Neural correlates of adaptive decision-making for risky gains and losses. Psychol. Sci. 18, 958–964. Windmann, S., Kirsch, P., Meir, D., Stark, R., Walter, B., Gunturkun, O., and Vaitl, D. (2006). On framing effects in decision-making: linking lateral versus medial orbitofrontal cortex activation to choice outcome processing. J. Cogn. Neurosci. 18, 1198–1211. Published online: 15 November 2011. Copyright: © 2011 Chen, Allen, Deb and Humphreys. This is an open-access article subject to a non-exclusive license between the authors and Frontiers Media SA, which permits use, distribution and reproduction in other forums, provided the original authors and source are credited and other Frontiers conditions are complied with.